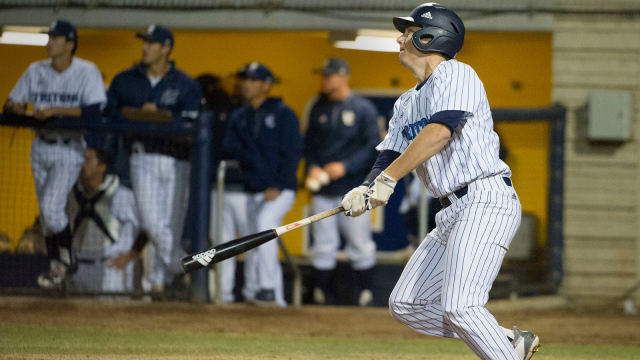 This weekend, the UC San Diego baseball team squared off against Cal State University San Bernardino for their ninth week of conference play. The series against San Bernardino was split into four games: the first pair of games at home, the second pair of games on the road. Wherever the game was played, the Triton showed up to play. The UCSD team walloped CSUSB, winning all four games in commanding fashion. The Tritons improve their record to 28–13 overall and 24–12 in conference. In the first game, UCSD set the tone for the rest of the series. At home and in front of a friendly crowd, the Tritons blew out the Coyotes 12–1. Through all nine innings, UCSD was almost able to keep San Bernardino scoreless: One run scored in the fourth inning saved the Coyotes from a shutout. The Triton’s scoring started off slowly, but quickly ramped up when it got started. By the end of the fourth inning, the score was 4–1. The Tritons held onto a nice lead, but the Coyotes were still in striking distance. As the game progressed, UCSD slowly built on this lead, scoring 2 more runs in the sixth inning. In the eighth inning, however, the Tritons truly put the game out of reach from the Coyotes. With the help of three home runs, the Tritons were able to score 6 runs off of 4 hits. The second player up at bat, redshirt sophomore catcher Nick Kitzmann, homered to right field, scoring the first run. Redshirt junior outfield Zander Clarke followed that up, homering to left field with the bases loaded and netting the Tritons 4 more runs. Redshirt sophomore Steven Schuknecht closed out the inning with a homer to right center field. At this point, the Coyotes were down for the count, playing out a unimpactful ninth inning before the Tritons could ultimately declare their victory. In the second game of the series, the Tritons were flying high, coming off a dominant performance in game 1. UCSD was able to follow it up with another commanding win. The Tritons shutout the Coyotes 19–0 in their second game. In this game, the Tritons had an even more impressive offensive performance. UCSD scored throughout the game: 2 runs in the second inning, 6 runs in the third inning, 6 runs in the fourth inning, and 5 runs in the seventh inning. Junior first baseman R.J. Prince and senior infielder Justin Beck recorded three runs each. Coupled with a nice performance at the mound by pitcher Preston Mott, who recorded 8 strikeouts, the Tritons were able to cruise to victory. For game 3, the Tritons headed out to Fiscalini Field in San Bernardino to start the second leg of the series. Despite not being in their home stadium, the Tritons were unperturbed and able to replicate their previous performances in the unfamiliar field. In the first road game of the series, UCSD came out strong, clobbering the Coyotes 26–8. Every player recorded at least one run, except the pitchers. The scoring was highlighted in the fifth inning, where the Tritons scored 8 runs off 6 hits. Top scorers include redshirt junior third baseman Alex Eliopulos, who scored 4 runs, and freshman shortstop Shay Whitcomb and Beck, who scored 3 runs each. Though they did not score, the two pitcher — Senior Jack Rupe and redshirt freshman pitcher Antonia Barrios — had solid contributions to the win. Combined, they recorded 5 ground outs and 8 strikeouts. In a performance that was a bit more tempered than the previous three games, the Tritons won the final game of the series 12–3. With the series already in the bag, the Tritons came out with performance that was more toned down than their previous three games. Despite the smaller point differential, UCSD still had a solid game. Beck lead the team in scoring with 3 runs; Eliopulos and redshirt sophomore utility Keenan Brigman tied for second with two runs each. On defense, redshirt junior pitcher Cameron Kurz recorded 6 strikeouts after just playing 2 innings. Redshirt junior catcher Michael Palos lead the the team with 9 outs. Next week, the team plays against another conference rival, Cal State University Los Angeles, in a four-game series: the first two played at home and the second two played on the road.